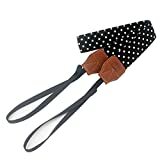 Universal strap fits for fujifilm instax mini 8, mini 50, mini 25, mini 90, mini 210 camera and all brands of DSLR camera: Canon, Fuji, Nikon, Olympus, Panasonic, Pentax, Sony, etc. This entry was posted in Discount Photography and tagged Belt, Black/White, Camera, Canon, Dots, DSLR, Fujifilm, Instax, Mini, Neck, Nikon, Olympus, Polaroid, Samsung, Shoulder, Simmax, Sony, Strap by Ball Photo. Bookmark the permalink.